How Long Does It Take To Break A Horse And Is It A Good Idea? “Breaking” a horse is a process of forcing it to learn a series of illogical, unconnected activities as quickly as possible. This process usually involves restraint, punishment and violence. Breaking can be a fairly quick way to force a horse to comply with your will, but when you are done, you have a broken horse. In this article, we discuss the concept of training vs. breaking a horse and explain why putting time limits on this process is unrealistic. Read on to learn more. 1 How Does Horse Breaking Work? 2 What Is Horse Training? 3 How Can You Communicate Clearly With Your Horse? 4 Why Is Good Communication More Important That Memorization Of Tasks? 5 How Long Does It Take To Train A Horse? How Does Horse Breaking Work? “Trainers” who break horses introduce activities that the horse is unfamiliar with and cannot understand. They fight the horse (often violently) until the animal gives up and performs the activity with no true communication taking place. This is a hit-or-miss way of teaching a horse anything because the animal will not have any logical activity to associate it with and may not be able to recognize cues to perform the same activity in an unfamiliar setting. Breaking just puts limits on the horse and constrains his activities to a box. This results in a horse who is literally a “trick pony” who cannot perform useful activities in a real world setting. This is very similar to a child who is “taught to the test” and can regurgitate memorized answers to specific questions but cannot generalize the information and apply it to real life. When you train a horse, you take the time to build trust and then introduce tasks incrementally in a way that makes sense to the horse. Horses have very good memories, but in order to understand, internalize and remember tasks, these tasks must be taught one or two at a time and in a way that connects them and makes good sense. Your horse should be able to understand the new task you are teaching because it is similar with and connected to something he already knows. Lessons should move forward logically and smoothly to avoid disruption, fear and distraction. It should be easy for your horse to succeed as you move forward, and he should not have to guess at your expectations. The responsibility is on you to make lessons sensible, logical and non-threatening. How Can You Communicate Clearly With Your Horse? Good communication with a horse begins with knowing one another well and trusting one another. Horses need regular routines and dependable, reliable communication. Your horse should be familiar with your voice and the words you use regularly to convey your intentions. He should be able to count on you to move around confidently without any shouting, hitting, flapping your arms or other sorts of drama. When your horse feels secure and confident around you (and vice versa) you will find that he responds predictably to your natural body language. This will enable you to work toward specific, pinpointed physical signals and quiet verbal cues. The ideal is for you to be able to communicate so subtly and effectively with your horse that you and he are the only ones aware of the communication. Notice how the rider in this video effortlessly teaches his horse that it’s safe to walk in an unfamiliar place by naturally dismounting to hand walk him through riding out. He is then able to ride through the potentially scary area without a hitch on the way back to the stable. This rider spends a great deal of time with his horse, and they have good communication so they can go into unfamiliar settings with confidence. Why Is Good Communication More Important That Memorization Of Tasks? If you want to ride your horse in shows or rodeos or other activities with specific rules attached, you could approach your goal by breaking your horse to perform the tasks needed for the specific activity. This might work to some degree, but simple, rote memorization of tasks is likely to result in a lackluster performance. Furthermore, if/when the rules of the activity change, you’ll have a hard time reprogramming your horse. Additionally, if something unexpected happens while you are participating in an event, and you don’t have good communication with your horse, your lack of good horsemanship will be on display for all to see. A horse and rider who don’t communicate well are a dangerous combination. On the other hand, if you have good communication with your horse, teaching him new tasks will be much easier. A horse who knows, trusts and understands you will have an easier time learning new things from you. When rules change or you decide to change to try a new activity, your confident, trusting horse will have an easy time going with the flow. If an emergency or frightening situation arises while you are participating in an event, you and your equine partner will be able to take it in stride. This is the definition of truly fine horsemanship. A horse who has understood and absorbed his lessons and is able to communicate well with his rider is like a child who has learned his lessons conceptually and is able to think critically to apply them to everyday life. How Long Does It Take To Train A Horse? Training your horse is a lifelong pursuit. If you start off with a young colt, you will begin training him the moment you start petting and brushing and putting on a halter. 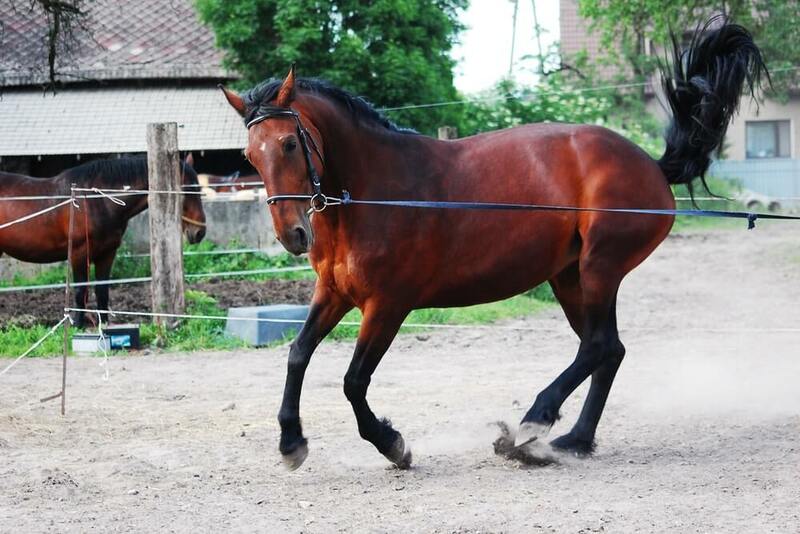 All the time you spend with your horse walking, talking and handling is training. When you introduce tack, that’s more training, and as you teach new activities throughout your horse’s life, you are still training. Sure, there are people who claim to be able to “break a horse in 4 days” or some-such nonsense, but who wants a “broken” horse? When you teach your horse instead of “breaking” him you will have a much more enjoyable, useful and reliable steed, and a friend for life. When you break a horse, you have a confused and broken animal. Truly skilled horsemen and women work in partnership with their horses. People who feel they must force horses to do their bidding are simply displaying their own lack of confidence and knowledge. Here is the first in a three part series about using the Join-Up method for horse training. Even though the title refers to “breaking”, what the presenter is doing is training. Note how he moves logically and smoothly from one task to another while building trust with this previously unhandled horse. I think that the beginning of this article is very subjective and solely based on opinion. Breaking a horse does not always involve, “…restraint, punishment, and violence.” Horses have to learn discipline and obedience, otherwise dealing with these animals is dangerous. L ets not forget that this is all they are, animals, this may sound cruel, but it is the truth. For somebody who has been around horses and, “learned to ride when she was 5.” it seems strange to me that the term, “breaking” and ” traning” have never been used as one in the same. Breaking does NOT always involve, “…a quick way to force a horse to comply…”. but, it does taech them respect and the fundamentals of becoming a trained horse. Breaking may seem like breaking a horses spirits or harming them both physicly and emotionally, when in reality is only is a word. ( Talk about reading too far into something!) different methods of, ”breaking” may be harmful, but lets not jump to conclusions and dub all breaking of horses to be cruel. breaking is simply a way to teach a horse respect, discipline obedience, and loyalty, you can love your horse all you want, but do you really want your kid on the idoit flying around the arena at the 4-H fair?